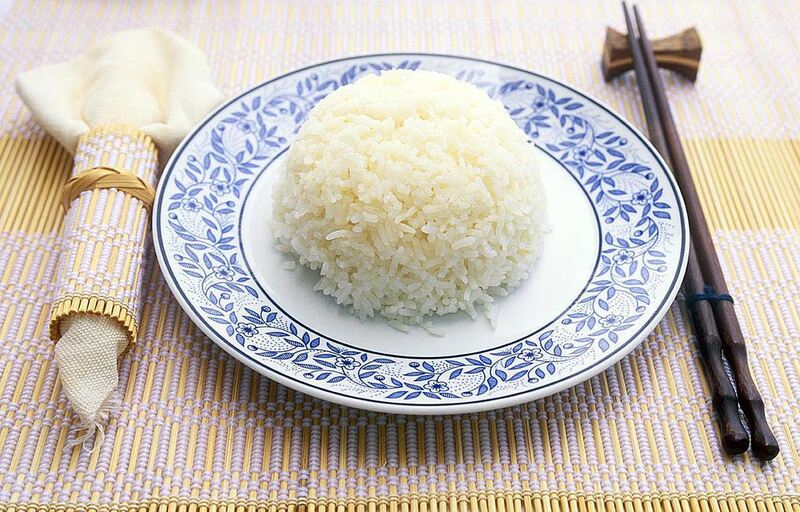 Steamed rice is a staple food for almost any Japanese meal and is considered the primary source of food in Japan. In fact, the name Gohan literally means "meal" and no Japanese meal is complete without it. All you really need is a heavy-based saucepan with a tight-fitting lid. Japanese rice is always short grain and usually polished white rice (hakumai) as opposed to the less attractive unpolished brown rice (gemmai). Names to look out for when purchasing rice for Gohan are "Japanese rice", sushi rice, "Calrose" short grain rice or "Japonica". Do not get confused with Jasponica - which is a blend of fragrant Thai Jasmine. It is important to wash and rinse the rice in cold water before cooking. The amount of water to cook Japanese rice is basically a little more than the amount of rice. The right amount of water to cook Japanese rice vary, depending on kinds and freshness of rice. If you are cooking rice in a rice cooker, please add water to the line indicated on the inner pot. Traditionally the Gohan is brought to the table in a tub made of cedar and dished to each individual's bowl with a wooden rice paddle. The rice is meant to become a little sticky when cooked which makes it easier to collect with the finely pointed Japanese style of chopsticks. Put the rice in a large bowl and wash it with cold water. Repeat washing until the water becomes almost clear. Drain the rice in a colander and set aside for 30 minutes. Cook the rice using either a rice cooker or a pot. If using the rice cooker, place the rice in the cooker and add water. Let the rice soak in the water ​for at least 30 minutes to an hour. An hour is ideal. Stop the heat and let it steam for about 15 minutes before opening the lid. Fluff the rice with rice spatula and serve into individual rice bowls. If you are cooking rice in a pot, put rice and water in the pot. Let the rice soak in the water for at least 30 minutes to an hour. An hour is ideal. Cover the pot with a lid and bring to a boil on high heat. Turn the heat down to low and cook about 20 minutes, or until the water is almost gone.